Barbara Tropp grew up in Springfield, N.J. and while taking a high school class on Asian culture, she discovered what she wanted to do with her life. She studied Chinese in college and then spent two years in Taiwan improving her language skills and immersing herself in food. Luckily, her host family had a fine cook; Tropp watched and learned. When she returned to Princeton, her fellowship was running out so she began giving cooking lessons and cooking Chinese dinners. Her thesis was soon forgotten and she moved to San Francisco and Chinatown. She soon had a book contract for "The Modern Art of Chinese Cooking," her attempt to present the authentic Chinese food she remembered from Taiwan. 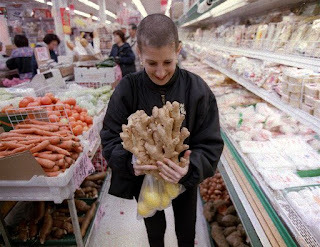 By the early 1990s, Tropp was a sought-after teacher and from 1986 to 1996, she ran a very successful Chinese restaurant named China Moon Cafe in a 1930s era coffee shop in San Francisco. In 1994, she and her sister decided to have their ovaries removed as their mother had died of ovarian cancer. During the surgery, it was discovered that both of them already had ovarian cancer. Tropp underwent chemotherapy and also sought alternative treatment from a local Chinese doctor who had run a cancer clinic in Shanghai. She took his advice and drank a mystery concoction and also avoided certain things in her diet. She went into remission and stopped the chemo. During this time, she sold China Moon. Unfortunately, on a trip to China with her husband, the cancer flared up again. "I learned that Chinese medicine offered me no protection at all," she says. "I threw the herbs out the window. I went back once or twice for acupuncture, but I found it so painful that I simply threw in the towel. I did strictly the Western chemotherapy regimen and, miraculously, I survived." Gradually, Tropp came to believe that diet didn't make her sick and a restricted diet wouldn't make her well. She would eat what she felt like eating, without guilt. "When I went into remission the second time, people would look at me and say, 'Golly, what saved you?' and I'd say, 'Starbucks ice cream.' "
Barbara fought her battle with cancer for 7 years but finally passed away in 2001. Chef Tropp broke ground not only in combining California and Chinese cuisines, but also as a leader for women chefs and restaurateurs. It was Barbara along with others like Joyce Goldstein and Lydia Bastianich who spearheaded a now-thriving organization which promotes and lends guidance to women in the restaurant industry: Women Chefs and Restaurateurs (WCR). As I searched through Tropp's recipes, I found one common theme: ginger. And because I love ice cream, when I read about her ginger ice cream, I knew I had to try it, especially since ice cream is rather an unusual dessert in China. It just never caught on much. I must say, I didn't expect to love and adore this ice cream, but I did. It's so elegant, really. There's lots of ginger but it's quite subtle and I found it delicious. It's amazingly difficult to take a photo of an ice cream like this....it just looks like plain old vanilla. But you know you can trust me on ice cream issues...this is one divine dish of ginger ice cream. You really don't need the candied ginger on top, but I happened to have some so added it for presentation purposes only. To make the syrup, heat the water and 1/4 cup sugar in a small saucepan over medium heat, stirring to dissolve the sugar. When the sugar is dissolved, add the fresh ginger. Stir to disperse, then bring the mixture to a boil over medium-high heat. Reduce the heat and simmer the syrup uncovered for 5 minutes. Remove the pan from the heat. In another pan combine the milk, 2 tablespoons sugar, and the minced preserved ginger. Stir over medium heat until the milk comes to a scalding temperature, just short of a simmer, then remove the pan from the heat. Scrape the fresh ginger syrup into the milk mixture, and stir well to blend. Cover and steep 20 minutes to infuse the milk. In a small bowl beat the egg yolks and 1/4 cup sugar until the mixture is pale yellow, thick, and falls in ribbons from the beater. Put the heavy cream in a medium-size bowl. Nest the cream bowl in a larger one lined with ice cubes and place in a large, fine mesh strainer alongside. When the steeping time is up, bring the milk mixture to scalding again, stirring. Slowly add 1/4 of the scalded milk to the egg mixture, whisking constantly to temper the eggs, then pour the egg mixture back into the remaining milk, continuing to whisk. Cook over moderate heat, whisking slowly but steadily until the mixture reaches the custard stage, thick enough to coat and cling to the back of a spoon, 180 degrees on an instant-reading thermometer. Do not let the mixture boil lest the eggs scramble. Immediately pour the custard through the strainer and into the bowl of cream set over ice. Scrape the pot clean, then slowly stir the liquid trapped in the strainer in order to coax it through the mesh. Press firmly and repeatedly on the ginger to extract all the liquid, then finally scrape the bottom of the strainer to claim every last drop for the cream. Discard the ginger solids. Allow the cream mixture to cool completely, stirring occasionally. Once cool, the mixture may be sealed airtight and refrigerated for 1 - 2 days before freezing. Just before freezing, adjust the mixture with 1/2 - 3/4 teaspoon fresh lemon juice, stirring and tasting after every several drops just until the ginger flavor is perceptibly heightened by the lemon. Freeze in an ice cream maker according to the manufacturer's instructions. 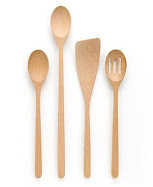 When the freezing process is completed, pack the ice cream into a clean plastic container, poking deep into the mixture, then pressing it with a spoon or spatula to eliminate any air bubbles. Press a piece of plastic wrap directly on the surface of the ice cream to prevent the formation of ice crystals, then return the mixture to the freezer for at least 2 hours to firm up and "ripen." If frozen solid, allow the ice cream to soften slightly in the refrigerator before serving. For the full flavor and bouquet, it should be eaten slightly soft. The ginger flavor is keenest for the first 24 hours. It is still sprightly after 2 days, but then gradually begins to fade. Join Mary from One Perfect Bite and all the other participants in this fun series. A note: something weird has happened to many of my older blog photos. They've disappeared from past posts. I have no idea if this is Blogspot's problem or mine after I fiddled around with Picassa, my new iPad or a combination of these things. So if you see an old recipe and want the photo, email me and I'll dig it out of my files. I love elegant ice creams! Sounds like a lovely treat, different but delicious. I love the China Moon bookbook and this is one of our favorite ice cream recipes. I highly recommend the "Strange Flavored Eggplant" as an appetizer from the same book. It's too bad we didn't get the opportunity to eat at China Noon Cafe but we can emulate some of her delicious recipes at home from her cookbooks. I ate at her restaurant and actually met her at the Food & WIne thing in Aspen. She was remarkable looking and had the most soothing voice with a very odd quality... when she spoke Chinese it was amazing. I still make her chermoula from that summer. I remember reading about her passing but had forgotten the alternative medicine problem... they think that's what killed Steve Jobs... he tried alternative first and when he caved to chemo it was too late. She was a cool lady... and this looks like great ice cream... you know how I love playing with my new toy!!! An interesting woman and a delightful recipe! This ice cream must taste heavenly. This is totally on my short-list...it sounds wonderful! I can't see any pictures on this post or on your header, either. I wasn't sure if it was just my computer or something. else. But even if I can't see it, I know I want a big bowl full! Sounds fabulous. What a strong woman. A fascinating story, thanks for sharing. And I love the sound of ginger ice cream. What an amazing story! I wonder if her sister is still alive. How sad to take the step to have your ovaries removed only to find out you were too late. Her ice cream recipe sounds delicious! I love ginger anything. I agree! It was absolutely delish! I would make it again. Yours looks lovely. I am so glad you got your shot in before it melted. Thanks for sharing. Mmmm! This is such a gorgeous way to end a meal! What a terrific choice to honor BT! If she's channeling these posts, she's smackin' her lips! I love green tea ice cream and ginger ice cream sounds like another winner. Was this something she came up with or do the Chinese really make and eat ginger ice cream? Barbara's story is truly amazing and a real testament to her courage. I'm enjoying this series of stories very much. Sorry to read about your problem with photos. The whole problem of blogs and parts of blogs disappearing is very troublesome. I had a terrible scare this week and thought I had lost my entire blog. I didn't, but I'm very worried about it. 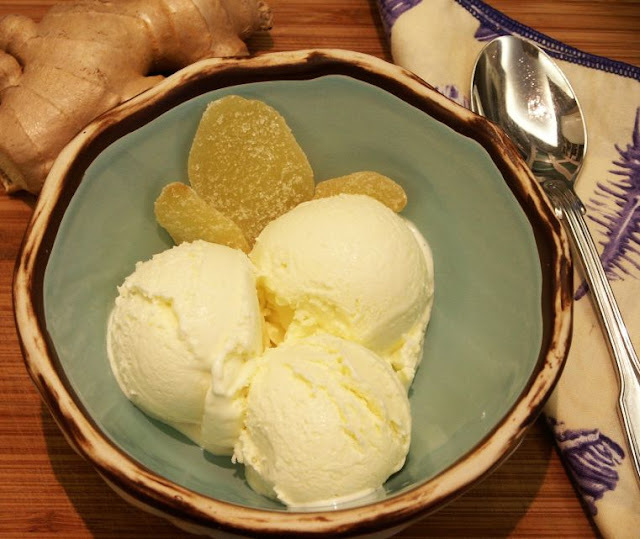 Ginger ice cream sounds completely divine! I get tired of the same old flavors and this is something new and exciting! I would probably mix in some minced crystallized ginger too - I love it in desserts. I love ginger and ginger ice cream sounds so fabulous! Will have to bookmark this for some time when it warms up around here. I enjoyed reading this and the ice cream looks wonderful. You captured the ginger "flavor" beautifully. I am having trouble with blogger too. I can't see my comments. OMG Barbara this is absolutely lovely and delicious!!!! Very interesting to read about BT--I of course have heard of her but did not know this much about her life. Her death is a loss to the culinary world. The ginger ice cream does look good! GREAT post, Barbara, thanks for sharing. The Ginger Ice Cream looks quite enticing. Does it have a little nip?